Digital transformation is changing the face of every industry today. Though the insurance sector has been a late adopter of the technology boom, it is definitely catching up. Digital transformation has become a priority for many insurers and that’s why they are investing not just in technology but are also building teams adept in taking their digital strategies a step ahead. According to a 2019 survey done by Accenture, 40% of the insurers say technology can improve customer loyalty and around half as many say it can help in boosting operational efficiency. For most insurers going ‘digital’ implies having online portals, a mobile app, some automated processes etc. While this may be a good start, it will still keep them at a very nascent stage of the ‘digital transformation’ journey. In the near future, the insurance marketplace is going to exist and operate out of the digital environment. Earlier, going digital was mostly limited to e-commerce, but with the rapid adoption of the internet, mobile, technologies like wearables, social media, big data and cloud computing the need to go digital is irrefutable and opportunities are immense. The digital disruption in the insurance sector is primarily driven by market forces like changing consumer preferences, competitors, technology innovations and the ever-changing regulatory model. Here is a view on how these factors are changing the insurance landscape. By 2021, e-commerce sales are expected to reach $4.5 trillion nearly double its value from 2017. However, the insurance sector has a long way to go when it comes to providing seamless and delightful digital experiences. Customers are demanding more customized and digitally optimized solutions from insurers. 90% of insurance respondents say that in five years, consumers will buy most of their insurance through online and mobile apps. However, the sector has taken only baby steps to cater to those. While nearly half of the customers expect more digital transactions, a survey suggests only 22% of insurers have launched personalized, real-time or mobile solution. The paper-based processes and legacy systems of the insurance sector rarely meet the expectations of today’s technology-savvy consumer. Hence, consumers prefer digitally mature insurance partners who can provide faster and advanced solutions. With the number of mobile users set to cross the $5 billion mark in 2019, today’s consumer is more connected than ever. Their expectations have also risen. Today’s digitally savvy consumers expect their insurers to provide value at every stage of the sales cycle and even post-purchase. Prudent insurers are already using digitization to provide consumers personalized experience. According to Oracle analysts, insurance companies deem customer experience more important than the product or sustainable growth. Many insurers are already moving away from mere transactional relationships with the consumer, to a more engaging one. They are looking at partnerships beyond financial enterprises to provide value-added services to their customers. For e.g. “Panasonic Smart Home & Allianz Assist” have partnered to provide integrated solutions which provide home monitoring and control systems along with home protection services. This solution protects people’s home from potential damage like break-ins, glass/window breakage, water leakage etc. Legacy insurers are waking up to competition not just from direct insurance players but also from Insuretech start-ups. While new entrants impose significant competition for the established players, many foresee competition coming from outside the insurance industry. According to a survey, 74% of insurers believe that some part of their business is at risk of disruption from Insurtech startups moving into their market. Digital stalwarts like Amazon and Walmart are capitalizing on the insurance industry’s sluggish evolution into the digital world to disrupt the market and scoop their share of the insurance space by catering to niche customer groups. Digital maturity is enabling these competitors to move and innovate with agility and offer personalized customer experience. The rise of aggregators’ business model has also given the power in the hands of consumers to compare quotes and coverage from multiple players, hence making the competition even stiffer for insurers. The emergence of technologies like Blockchain, Artificial Intelligence, Internet of Things (IoT), Predictive Analytics, Telematics etc., presents a huge opportunity for insurers to collect and exchange data about consumers, identify new growth opportunities and personalizing consumer experience. Blockchain – Increasing digital transactions, complex compliance protocols third-party payment channels fraudulent claims, etc. are some of the challenges that the insurance sector faces. According to Mckinsey, five to ten percent of all insurance claims are fraudulent. This is where the insurance sector is starting to see the potential of blockchain technology. For instance, Blockchain Insurance Industry Initiative, B3i, launched by organizations such as Swiss Re, Aegon, Allianz, Munich Re, and Zurich aims to explore the potential of distributed ledger technologies to better serve clients through faster, more convenient and secure services. Internet of Things (IoT) – Insurers are using IoT and the ever-connected ecosystem to provide proactive solutions to consumers. IoT is opening up non-traditional insurance data to insurers which could reveal risk factors, enabling insurers to offer a price differentiation or new value propositions. Mobile-Based Telematics – Mobile-based Telematics enables innovation in usage-based insurance (UBI). Telematics mobilizes the data collection process using telecommunications and information processing tools. Right now, it is largely used in the auto insurance sector where data collected through mobile devices deployed in the vehicles can help in analyzing driver behavior and provide customized services accordingly. Predictive Analytics – Predictive analytics techniques can help insurers analyze real-time data from the web and social networks and reach out to the right audience with personalized products and services. Gamification – Gamification as a tool helps in gaining higher customer engagement. Insurers are using it to incentivize customers through rewards and loyalty points or discounts. Gamification apps using fitness data from wearables can help insurers to incentivize with lower premiums for maintaining healthy habits. 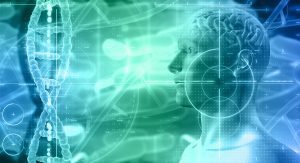 Artificial Intelligence – According to IDC, by 2020 the amount of data available will grow 10-times, and there will be 1.7 megabytes of new information created every second for every human being on the planet. In the next few years, we will be collecting more data on how people make decisions on a day-to-day basis and this will give insurers more understanding of the personal risk attitudes of people and therefore drive better insurance products and coverage in new areas. AI can be useful in analyzing real-time data and assist with fraud identification, identifying subrogation opportunities, shorten claims cycle time, improve claims forecast etc. According to a survey, 79% of insurance executives believe that AI will revolutionize the way insurers gain information from and interact with their customers. In 2017, Lemonade Insurance made headlines when its AI Jim settled a claim in less than 3 seconds, while the topmost insurers take 316,800 times longer to complete the settlement vs Jim. The compliance regulations of operations in the insurance industry are constantly changing and the legacy systems requiring tons of paperwork is not built to keep up with the ever-changing nature of the industry. Automated digital platforms make it easier for insurers to comply with regulatory guidelines, reduce the number of resources required for managing compliance and mitigate risks. The insurance industry is seeing the emergence of RPA (Robotic Process Automation) to deal with the ever-changing regulations system. RPA can help in capturing the changes in the business rules, interpret data sources and communicate the changing compliance regulations to the current systems. Becoming a digital insurer is not just about implementing technology at an organizational level. Instead, it’s about creating a wider platform that can connect customers, partners, and employees all at the same time. Here is how insurers can implement a successful digital transformation plan for their organization. Assessing where you lie in the digital transformation map is the first step towards this journey. Becoming a true digital insurer, cannot be limited to operational automation, it has to permeate every aspect of the organization from front end to back end processes, from policy to purchase claims and from finance to HR. Achieving an organization-wide change would require commitment at every touch point. Digital transformation is not just meant to benefit the end user, but also making your organization change ready and agile enough to adapt quickly. That’s why aligning the organization for the change is an important step towards this journey. Creating a step by step plan for digital transformation is critical and planning ahead is required, but over planning should be avoided. Change is the only constant and it is as true for the insurance industry as well. The digital transformation plan for your organization should be flexible enough to incorporate the changing dynamics and technological advancements getting introduced in the industry during the course of implementation. The best approach would be having a long-term goal but a phase-wise plan. Insurers can start with analyzing market trends and start with the markets where digitization would solve most problems or bring the most benefits. For eg: bringing improved experience in areas with most consumer activity. The next rational step would be to develop a plan to modernize core systems with cloud-based technologies to better support middle and front-office systems. This will help in improving the technical efficiency, streamlining costs and schedule risks of the modernization efforts. Mobile Capture — this process can help in expediting the applications and claims process significantly by allowing policyholders to apply for policies or initiate claims digitally at their convenience. It takes away a lot of manual processes like data entry or postal efforts because insurers can use mobile capture to send in forms, reports, and status to clients. Customer Communications Management (CCM) — establishing a CCM system will help insurers built better customer relationships by enabling timely communications with relevant information. CCM can take care of real-time tracking, status updates, on-time alerts etc. leaving employees to focus better on other business tasks. Robotic Process Automation (RPA) — RPA can help insurers to improve customer management and making sure that compliance requirements are met. RPA system can collect and integrate data from the external website, portals, and applications and therefore automate activities like price matching, coverage comparisons or keeping a tap on regulatory compliances etc. Case Management — one of the major challenges that the insurance sector face is doing away with the highly paper-based system. The automated case management system can help in digitization of documents, tracking case status, managing caseloads etc. With the help of Business Process Management (BPM) and Enterprise Content Management (ECM) systems case management system can be highly effective. Integrating the case management system with CCM can lead to highly optimized and enhanced customer experiences as well. 70% of Life and P&C insurers lack the confidence to execute complete digital transformation because they feel they don’t have an achievable plan with critical elements such as a clear vision, compliance, and risk processes. A digital transformation plan cannot be successfully implemented with an ‘ad hoc’ team; doing so will only complicate the process. In fact, a poorly implemented system will lead to insurers spending more time, money and effort in managing the disparate system. Therefore, it is important to build a “digital transformation task force” for the job. Prudent insurers are realizing the importance of having a dedicated team in a survey almost 87% of insurance firms said they have a dedicated ‘digital innovation’ teams. The dedicated team should comprise of members from each area of digital impact in the journey, this will help in bringing expert advice and planning across each touch point in the journey. The infrastructure is the backbone of the entire process. It will play an important role in the seamless implementation of the digitization process (release cycles, automated testing, and deployment) and managing interactions across the partner ecosystems. 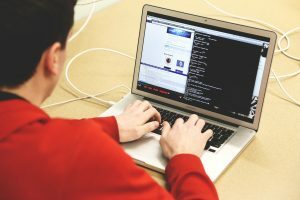 Therefore, it is important to have a robust infrastructure which can help in redesigning of the front-end systems to provide rich user experience and also their integration with the back end operations. 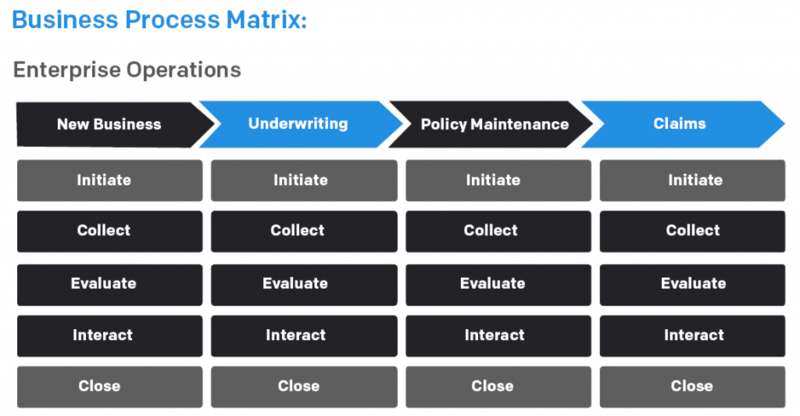 A typical insurer’s operational cycle would resemble the below matrix. The above image represents the core function of an insurance policy lifecycle at the top, from left to right(New Business, Underwriting, Policy Maintenance, and Claims). Any core function of the business will have a trigger to initiate, then data collection, data evaluation, customer/stakeholder interaction and closing the deal. All of these functions at an organizational level would be supported by functions like HR, Marketing, Accounting, IT etc. This means the insurance process is highly integrated across organizational levels and therefore it is important to have a robust IT infrastructure to support each and every element of this integrated ecosystem. The new-age consumer is evolving into a more technology savvy and connected consumer, resulting in an explosion of data through multiple channels data through multiple technologies like IoT, wearables, social media etc. Drawing actionable insights from all this data like analyzing customers’ pain point, anticipating their needs and providing a customized solution will help insurers stay ahead of the curve. In the healthcare insurance sector, health insurance provider Humana in the United States has partnered with Apple, and they let consumers share their Apple HealthKit data with the Humana Vitality app. 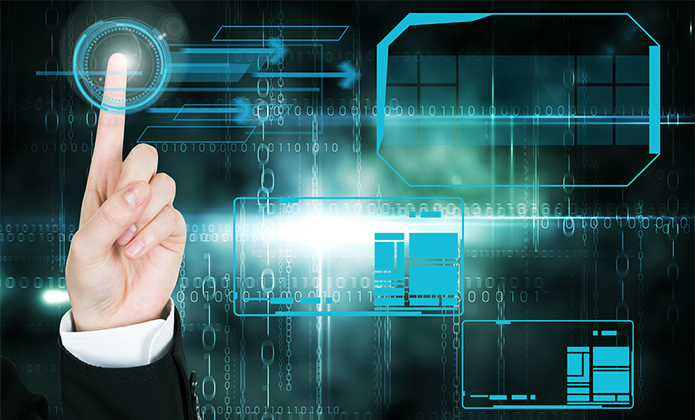 Any digital transformation plan should involve a process to unlock internal data sources, leverage external data sources and better gather, mine, analyze and visualize that data with advanced analytics technologies and finally, turn this data into action to provide a personalized experience to the user throughout the value chain. Choosing the right technology partner is the most important step in implementing a successful Digital transformation plan. Many insurers have started realizing this fact. 51% of insurers plan to partner with major digital technology and cloud platform leaders within the next two years. It is important to carefully choose a partner who understands not just your business well but is also capable of understanding your operational processes well. The digital transformation process is going to be integrated across all your processes, therefore it is critical to work with a partner who is comfortable with your processes, knows the limitations and will help you in improvising during the course of implementation. Digital transformation in the insurance industry is not just a means of adopting market trends but is an ongoing process to innovate, stay relevant and stay ahead of the competition. 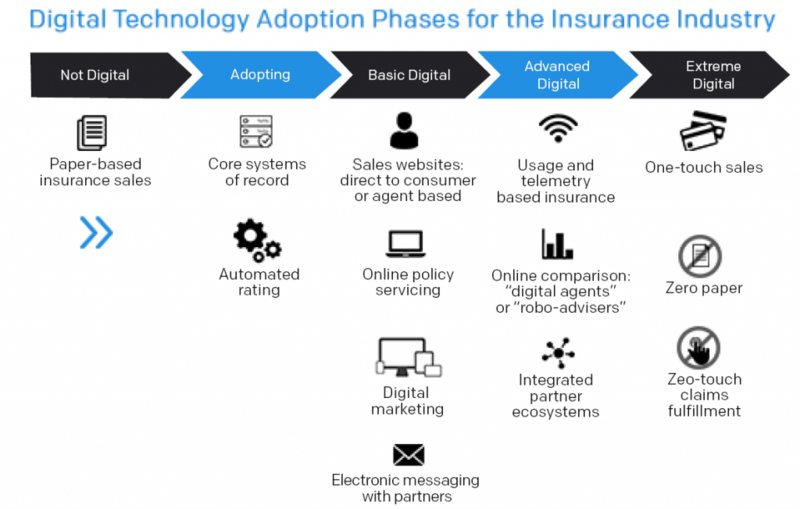 The legacy insurance ecosystem is usage based and telematics- led industry and incorporating advanced digital propositions will help insurers capitalize on the future. A fully digitized process can go a long way in optimizing processes and reducing costs. For e.g. an integrated claims supply chain can enable insurers to reduce costs across the enterprise, improve customer service and mitigate risks even before an event occurs. Forty-seven percent of insurers say a lack of collaboration with the IT function is preventing them from realizing their technology investments’ value. Digitization of operations will help to break down silos within the organization and allow for faster processes. In this age becoming a digital insurer is a mandate for insurers to stay relevant, sustain growth and increase profitability. However, it requires an org-wide transformation to reap the true benefits of digitization. In the light of changing consumers needs, increased competition, technology, and data disruptions and ever-changing compliance landscape, it has become a must for the insurers to choose the path of digitization. However, a successful digital transformation requires a broader approach, than just introducing automated processes. It will require these 7 steps to truly transform your organization: assessment of your digitization capabilities, stakeholders buy-in, an agile plan, dedicated task force, robust IT infrastructure, capitalizing on data, and most importantly choosing the right digital partner. If done right digital transformation can enable your organization to not just stay relevant but gage and capitalize on the upcoming opportunities as well. 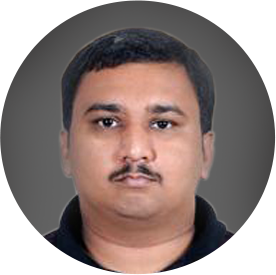 Nikunj Sanghvi Nikunj is passionate about technology, design and mobile and stays up to date with current trends in these domains. He leads our Sales and Business Development efforts in the US, out of our San Francisco office.